Welsh dressers are considered an investment in Wales. They cost a substantial amount but they have retained their resale value over time. 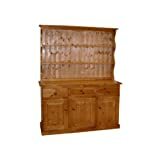 One should be prepared to meet the cost as Welsh dressers are made from the highest quality pine and solid oak. Welsh dressers tend to be multipurpose in nature as you could use them to store away or display your stuff in a tidy manner. Since they are pricey you may want to make up your mind on which dresser type you would prefer going for. 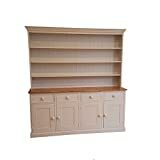 You will mostly find solid wood dressers in the market and these are further available as oak and pine dressers. 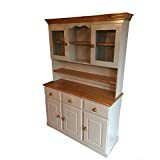 Although other natural wood made welsh dressers may also be available, they may be rare as oak and pine tend to be the most popular types in the UK. And this is for a good reason owing to their durability.